One of the best times to visit Spain is in the days leading up to a public holiday, when the pastelerías (pastry shops) start stocking up on the popular sweet delicacies traditionally consumed during the specific festivities, and with there being so many public holidays, it is no surprise that the choice of cakes is endless. 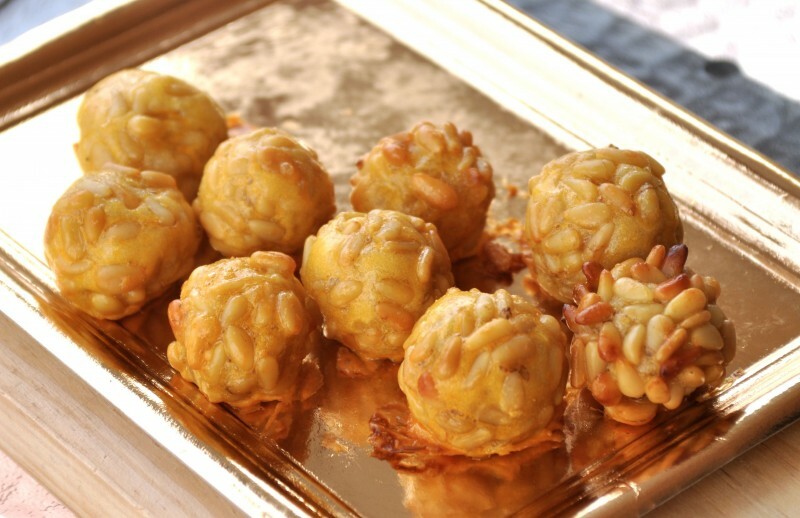 From the middle of October until the beginning of November all of the traditional pastry shops in Alicante and other cities in the Valencian region will be selling two types of typical marzipan cakes: Huesos de Santo and Panellets. Both are traditionally consumed on El Dia de Todos los Santos (All Saint’s Day), which is celebrated in Spain on the 1st November, and coincides with the harvest time for almonds, hence the reason for marzipan being the prime ingredient in both sweets. On El Dia de Todos los Santos, Christians in Spain celebrate a ritual holiday of remembrance in honour of their deceased relatives.This day commemorates all of the dead who are believed to have passed through Purgatory, been sanctified and have attained the ‘beatific vision’ in Heaven, consequently enjoying eternal life in the presence of God. All Saints Day is a day of great significance during which relatives will visit the graves of the dead, honouring them with flowers and the lighting of candles, often staying for many hours as family members visit and share the occasion.This is a major event in the family calendar and following a visit to the cemetery it is normal practice for families to share a meal. The Huesos de Santo or “Bones of the Saints” are one of the popular desserts and sweets consumed by families in the Valencian region and other parts of Spain during these festivities, dating back to the seventeenth century, when they are believed to have originated in Madrid. 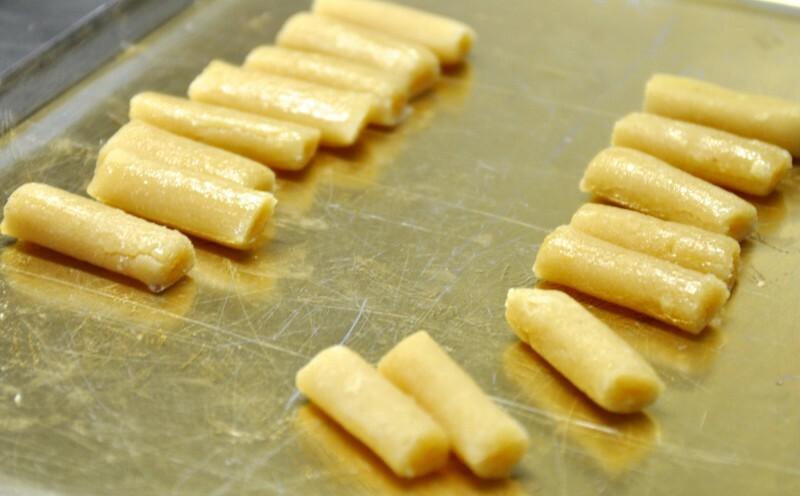 They are small and white marzipan bites made in long cylindrical pieces, and filled with sweet egg-yolk cream, with their shape intentionally imitating the bones of the saints. They are traditionally made by rolling out marzipan (a paste made from almonds, sugar and water) to make a base, which is then cut into a neat rectangle, and then cut again into strips which are filled with the sweet yolk filling. They are then folded into neat rolls and cut again into pieces usually five or six centimetres in length. 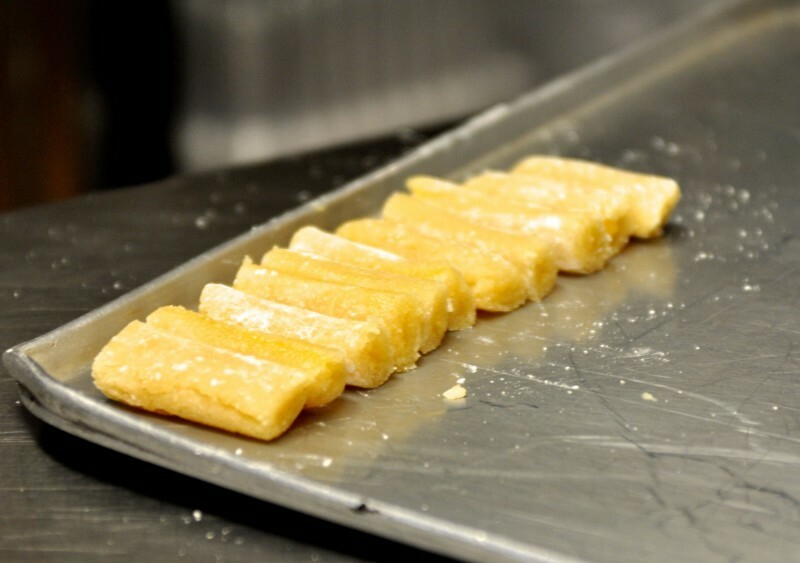 The pieces are then refrigerated for two hours before they are then garnished with a mixed syrup of honey, lemon juice, water and icing sugar, giving them a shiny appearance and a zingy flavour. Finally they are left to set for another 2 hours before being served soft and cool. Although the traditional filling is sweet egg-yolk cream, today there are many variations of the Huesos de Santo as they can be found filled with sweet potato or other confections such as plum, coconut, chocolate, praline or even yogurt. These are sold widely across the region in many pastelerías or artisan events. 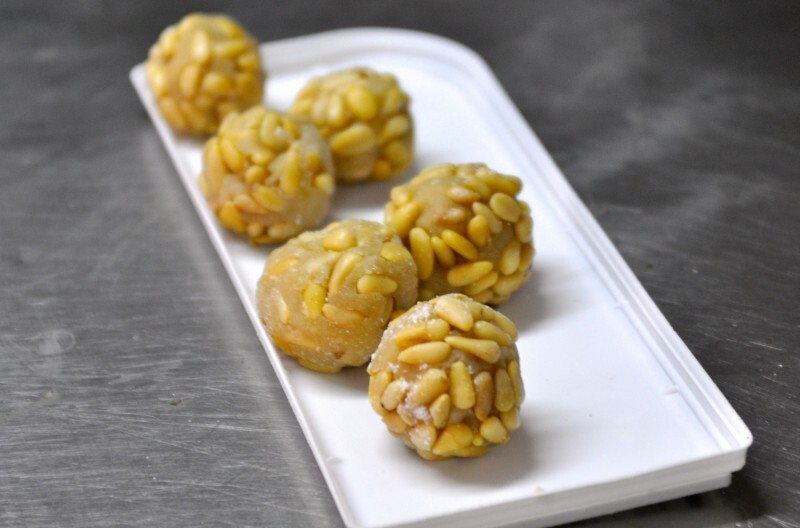 Another traditional dessert of All Saint’s Day is Panellets, or ‘Empiñonados’, which are small round cakes made mostly of marzipan and traditionally covered with pine nuts and varnished with egg. These little marzipan balls date back to at least the 18th century, when they were consumed as holy food for sharing during several religious celebrations, most notably in the fiestas of Sant Marc and Santa Creu in Cataluña, and are often accompanied with sweet wine. Within Europe, Panellets have TSG status (Traditional Specialities Guaranteed), meaning that the quality of the traditional forms of these cakes is always uniform, including the purity of their ingredients and their method of production, which is always by hand. 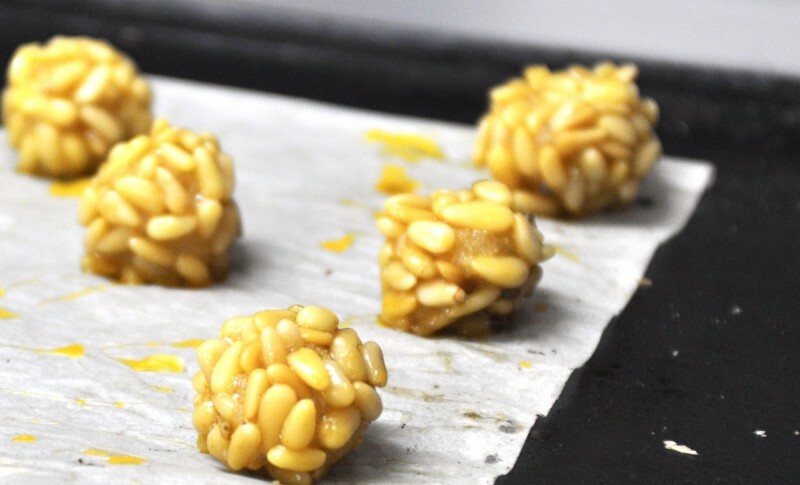 The most traditional Panellets are simply made by moulding marzipan into tiny balls and covering them with pine nuts, before then dunking them in a bowl of egg yolk and baking them in the oven at 230 degrees for about 5 minutes, so that they come out nicely toasted and crispy on the outside. Sometimes pastry stores sell different variations of these marzipan treats, such as chocolate, orange or strawberry panellets, and instead of pine nuts, some can be found covered in other nuts such as pistachios or walnuts. Sweet lovers will absolutely adore both of these little marzipan treats, which are popular among both children and adults during this festive time as a tasty, energetic snack or a nice accompaniment to a morning coffee. Both the Huesos de Santos and the Panellets can be found for sale in almost any of the traditional, artisan pastry shops in Alicante and the surrounding comarcas, where they are sold individually or in batches between October and November. Considering their small size, they may appear quite expensive, but this is because in the traditional 'pastelerías' they are made completely by hand, which, considering how much folding, moulding and cutting is involved to make just one batch, is a rather lengthy process! They are also made entirely from almonds, which adds to the cost. 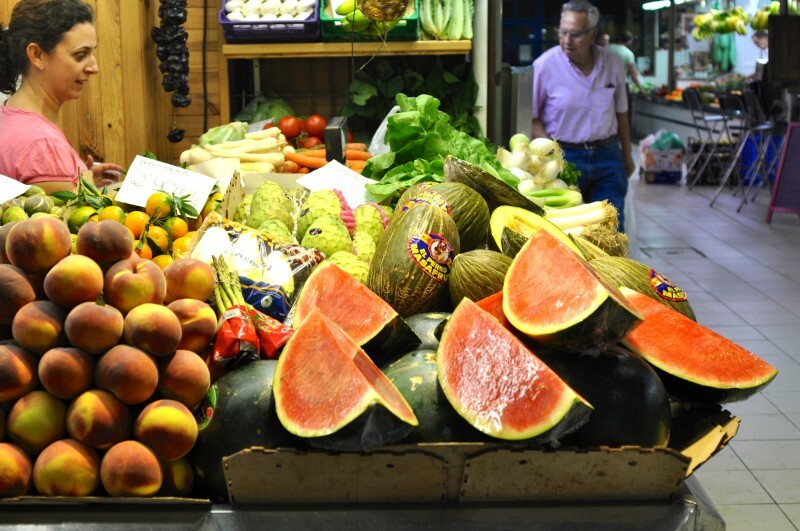 Panellets and Huesos de Santo:..
October and November is the time for the sweet marzipan cakes; Huesos de Santo and Panellets One of the best times to..